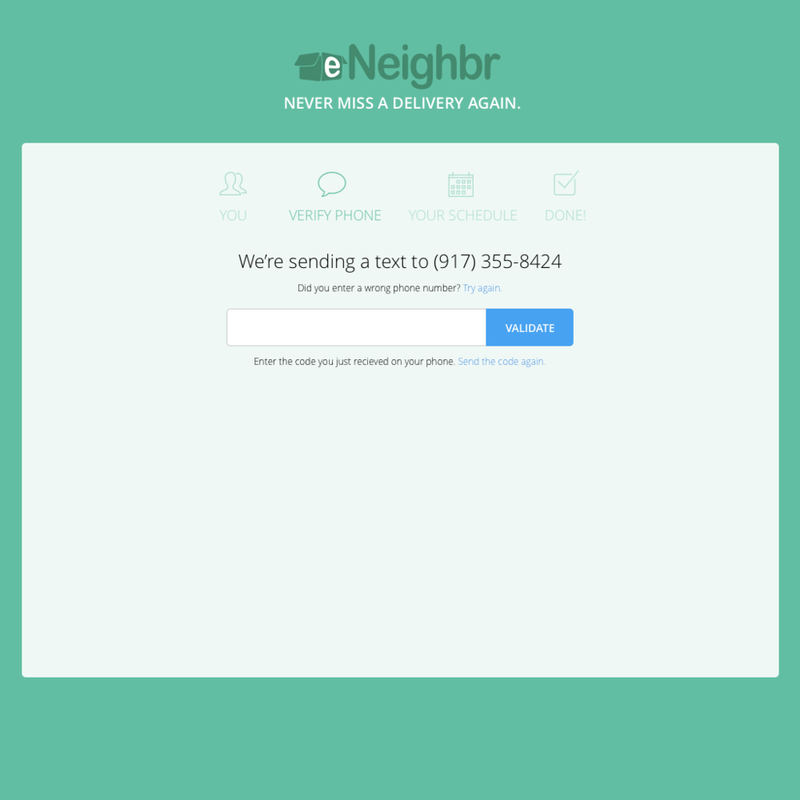 eNeighbr delivers your packages to a neighbor, who will sign and hold them for you. eNeighbr is a small NYC startup that solves the problem millions of New Yorkers have: getting packages that are sent to your apartment. Co-founders Jonathan Ide and Brian O'Connell approached me to head up their product and design efforts on a consulting basis. As a New Yorker myself, I knew the pain well. Trying to track where your FedEx or UPS package went after you get that dreaded little slip on the door is a nightmare. Ever go to the UPS facility over in Tribeca? Forget it. Takes hours. I was definitely interested in helping to solve this problem. Check out our holiday commercial. We conceived, shot, and edited this ourselves! We met up and they showed me their workflow diagrams. It was a dizzying array of lines, boxes, and paths that took a while to understand. I asked if we could start simplifying the process. Get something simple that we could all get our heads wrapped around. There were many moving parts, but the key was to get eNeighbrs to onboard. Without them, there was no startup. So that's what we focused on first. 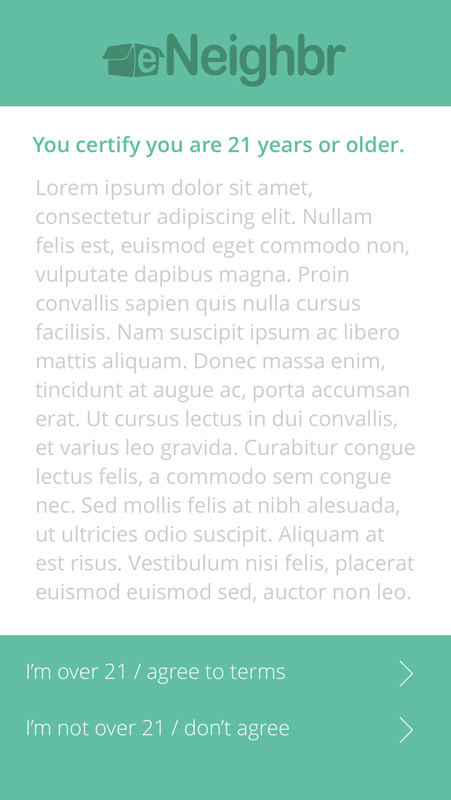 I pushed for a native iOS app. It would be much faster, have geolocation built in, camera, and a whole host of other reasons. I loved the user experience of Shyp and wanted to do something similar to that. But the guys didn't want to leave out Android users, and let's face it, there are a lot of them. I tried again several times, but lost out. So responsive web it was. At the least, we were all on the same sheet of paper when it came to going with a mobile first strategy. Onboarding eNeighbrs first, on mobile, was the first problem we tackled. The user experience took make twists and turns but within a few weeks we started to see the light at the end of the tunnel and the product started to take shape. We used phone # as primary ID key to get customers into the idea that SMS was going to be one of the major methods they use to communicate with eNeighbr, and their customers. As we did revisions and iterations on eNeighbr, we made the experience even more friendly and neighborly. The desktop experience is also nice and clean, with easy steps along the way. Here are some selected screens from the desktop experience. 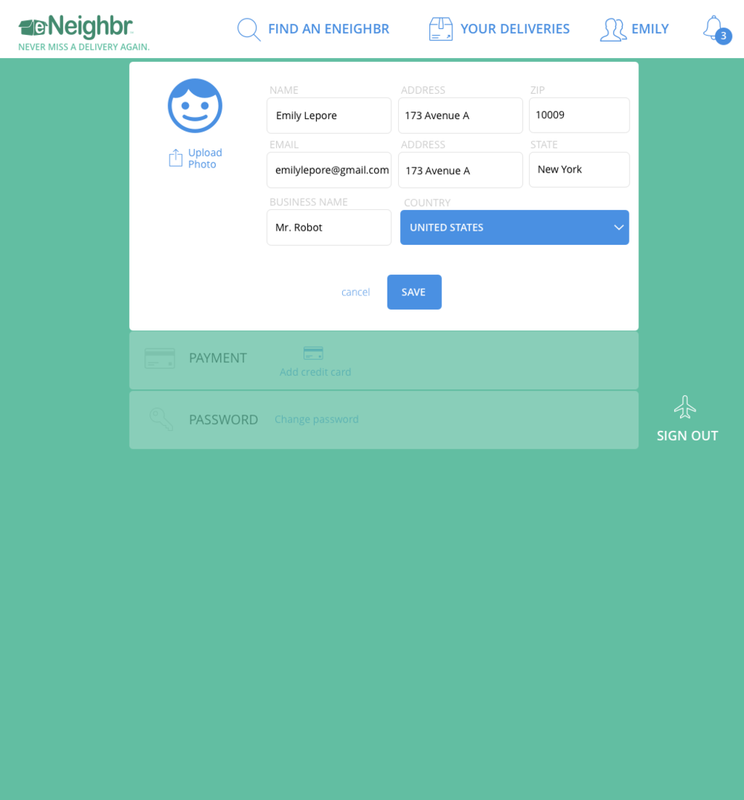 We needed a platform, or portal for eNeighbrs and customers to be able to go in and configure settings, add / update credit cards, their profile, etc. Jon gave me some basic requirements to work from, and we got to designing. It turned out pretty well. Customers had less to do on the site, but nevertheless needed a platform to perform some basic actions, like adding a bank, updating their info, payment options, etc. And of course, chatting with their eNeighbrs! What if you were both a customer and eNeighbr? It's the same problem if you're also an AirBNB customer and AirBNB host. It's an edge case, but we solved for it with what I call a "switcheroo." Here, Emily can switch between her eNeighbr account and her customer account. If you have problems getting your packages, give eNeighbr a try. It's only $5 bucks.